The playground alone is worth the trip. Equal parts tranquil and educational. Cumulative distance of three trails. The trails are mostly grass and dirt with small sections of uneven boardwalk. The grounds are fairly flat with gentle hills. The nature center building is handicapped accessible. Walking at a comfortable pace, you can cover all the trails and tour the nature center building in an hour and a half. Short on time? Skip the Mead School Trail. Pets must be on-leash on the trails. No dogs are permitted in the playground. Once a 150 acre dairy farm, Ansonia Nature and Recreation Center has reverted to its natural ways. Trails wind through young forests, meadows, streams, and an upland swamp. At the heart of the park is the Visitor Center, which houses classrooms, restrooms, and an assortment of small animals undergoing rehabilitation. 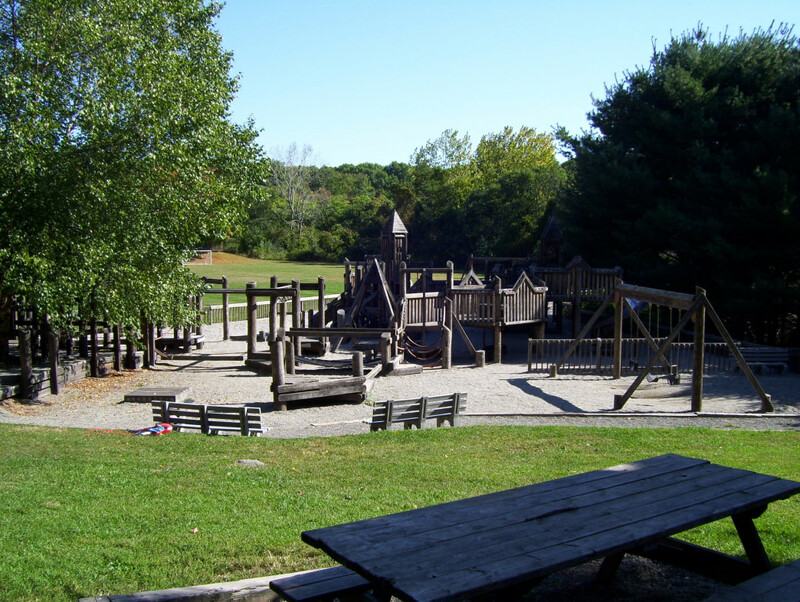 The park also includes ball fields, an extensive community garden, and a huge wooden playground that is worth a visit all by itself. 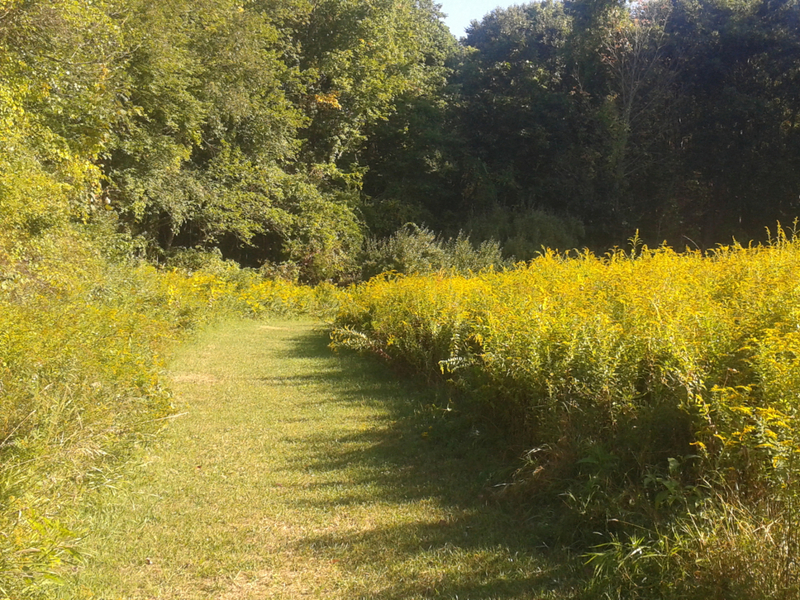 Walking through the Ansonia Nature Center on a late-summer day is simply refreshing. 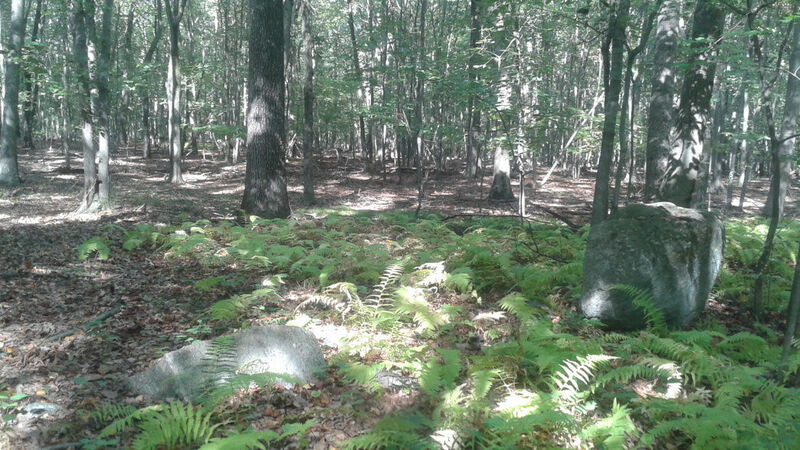 The woodland feels open - there's still plenty of light for ferns to flourish - and the meadows are thick with goldenrod and milkweed. Dragonflies dance over the stream, and young children play outside the Center's nature-based preschool. The apple trees in the community garden give off that delightful smell that tells you fall is coming to New England. A family of partridges crosses a dirt road in front of a manual water pump, and all is right with the world. In addition to being pretty and peaceful, the Center wants to educate. Signs provide not just species identification info, they also explain how people and other animals utilize the tree's wood, leaves, seeds, and fruit. A piece of plywood lying on the ground encourages you to carefully lift it to see if a snake is sleeping there. And the Center offers a wide range of free or cheap programs for student groups, families, and anyone interested in learning about anything from astronomy to beekeeping to apple pie baking. The only thing that disturbs the peace here is the not-distant-enough sounds from the neighbors at the Ansonia Rod and Gun Club's shooting range. 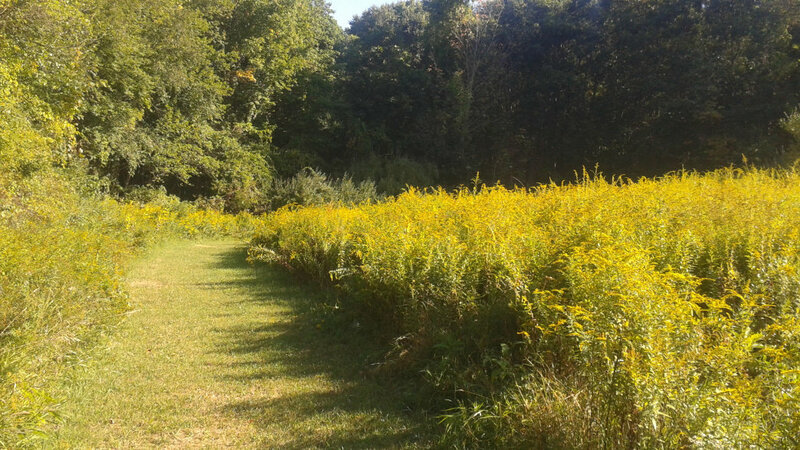 Hunting is not permitted in the park but IS allowed on neighboring land in the fall, so they recommend wearing brightly colored clothing when walking on the Center's trails during the fall hunting season. According to the Center's newsletter, "In our 30-year-plus history, we have not had any 'incidents' with these good neighbors." There's a large parking lot next to the visitor center at 10 Deerfield Lane. Grounds are open daily during daylight hours. Visitor center hours vary with the season, but general office hours are 9am-5pm daily except on major holidays.